Scoliosis is a medical condition in which a person's spine has a sideways curve. The curve is usually "S"- or "C"-shaped. In some, the degree of curve is stable, while in others, it increases over time. Mild scoliosis does not typically cause problems, while severe cases can interfere with breathing. Typically, no pain is present. The cause of most cases is unknown, but is believed to involve a combination of genetic and environmental factors. Risk factors include other affected family members. It can also occur due to another condition such as muscles spasms, cerebral palsy, Marfan syndrome, and tumors such as neurofibromatosis. Diagnosis is confirmed with X-rays. Scoliosis is typically classified as either structural in which the curve is fixed, or functional in which the underlying spine is normal. Treatment depends on the degree of curve, location, and cause. Minor curves may simply be watched periodically. Treatments may include bracing or surgery. The brace must be fitted to the person and used daily until growing stops. Evidence that chiropractic manipulation, dietary supplements, or exercises can prevent the condition from worsening is lacking. However, exercise is still recommended due to its other health benefits. Scoliosis occurs in about 3% of people. It most commonly occurs between the ages of 10 and 20. Girls typically are more severely affected than boys. The term is from Ancient Greek: σκολίωσις, translit. skoliosis which means "a bending". The many causes of scoliosis include spinal deformities, neuromuscular problems, and inherited diseases or conditions caused by the environment. An estimated 65% of scoliosis cases are idiopathic, about 15% are congenital, and about 10% are secondary to a neuromuscular disease. Idiopathic scoliosis represents a majority of cases, but its causes are largely unknown. Recent studies indicate potential heritability of the disorder. About 38% of variance in scoliosis risk is due to genetic factors, and 62% is due to the environment. The genetics are likely complex, however, given the inconsistent inheritance and discordance among monozygotic twins. The specific genes that contribute to development of scoliosis have not been conclusively identified. At least one gene, CHD7, has been associated with the idiopathic form of scoliosis. Several candidate gene studies have found associations between idiopathic scoliosis and genes mediating bone formation, bone metabolism, and connective tissue structure. Several genome-wide studies have identified a number of loci as significantly linked to idiopathic scoliosis. In 2006, idiopathic scoliosis was linked with three microsatellite polymorphisms in the MATN1 gene (encoding for matrilin 1, cartilage matrix protein). Fifty-three single nucleotide polymorphism markers in the DNA that are significantly associated with adolescent idiopathic scoliosis were identified through a genome-wide association study. Adolescent idiopathic scoliosis has no clear causal agent, and is generally believed to be multifactorial. The prevalence of scoliosis is 1% to 2% among adolescents, but the likelihood of progression among adolescents with a Cobb angle less than 20° is about 10% to 20%. Another form of secondary scoliosis is degenerative scoliosis, also known as de novo scoliosis, which develops later in life secondary to degenerative (may or may not be associated with ageing) changes. This is a type of deformity that starts and progresses because of the collapse of the vertebral column in an asymmetrical manner. As bones start to become weaker and the ligaments and discs located in the spine become worn as a result of age-related changes, the spine begins to curve. The word 'de novo' is associated with this form of scoliosis as it means 'new', referring to the occurrence of the condition during later life. People who initially present with scoliosis undergo physical examination to determine whether the deformity has an underlying cause and to exclude the possibility of underlying condition more serious than simple scoliosis. The person's gait is assessed, with an exam for signs of other abnormalities (e.g., spina bifida as evidenced by a dimple, hairy patch, lipoma, or hemangioma). A thorough neurological examination is also performed, the skin for café au lait spots, indicative of neurofibromatosis, the feet for cavovarus deformity, abdominal reflexes and muscle tone for spasticity. When scoliosis is suspected, weight-bearing, full-spine AP/coronal (front-back view) and lateral/sagittal (side view) X-rays are usually taken to assess the scoliosis curves and the kyphosis and lordosis, as these can also be affected in individuals with scoliosis. Full-length standing spine X-rays are the standard method for evaluating the severity and progression of the scoliosis, and whether it is congenital or idiopathic in nature. In growing individuals, serial radiographs are obtained at 3- to 12-month intervals to follow curve progression, and, in some instances, MRI investigation is warranted to look at the spinal cord. Congenital and idiopathic scoliosis that develops before the age of 10 is referred to as early-onset scoliosis. Scoliosis that develops after 10 is referred to as adolescent idiopathic scoliosis. Screening adolescents without symptoms for scoliosis is of unclear benefit. Scoliosis is defined as a three-dimensional deviation in the axis of a person's spine. Most instances, including The Scoliosis Research Society, define scoliosis as a Cobb angle of more than 10° to the right or left as the examiner faces the person, i.e. in the coronal plane. Scoliosis has been described as a biomechanical deformity, the progression of which depends on asymmetric forces otherwise known as the Hueter-Volkmann Law. Treatment for idiopathic scoliosis also depends upon the severity of the curvature, the spine’s potential for further growth, and the risk that the curvature will progress. Mild scoliosis (less than 30° deviation) may simply be monitored and treated with exercise. Moderately severe scoliosis (30–45°) in a child who is still growing may require bracing. Severe curvatures that rapidly progresses may be treated surgically with spinal rod placement. Bracing may prevent a progressive curvature, but evidence for this is not very strong. In all cases, early intervention offers the best results. A growing body of scientific research testifies to the efficacy of specialized treatment programs of physical therapy, which may include bracing. A number of specific exercises or physiotherapy may be useful. Evidence to support their use however is weak. Bracing is normally done when the person has bone growth remaining and is, in general, implemented to hold the curve and prevent it from progressing to the point where surgery is recommended. In some cases with juveniles, bracing has reduced curves significantly, going from a 40° (of the curve, mentioned in length above) out of the brace to 18° in it. Braces are sometimes prescribed for adults to relieve pain related to scoliosis. Bracing involves fitting the person with a device that covers the torso; in some cases, it extends to the neck. The most commonly used brace is a TLSO, such as a Boston brace, a corset-like appliance that fits from armpits to hips and is custom-made from fiberglass or plastic. It is sometimes worn 22–23 hours a day, depending on the doctor's prescription, and applies pressure on the curves in the spine. The effectiveness of the brace depends on not only brace design and orthotist skill, but also people compliance and amount of wear per day. The typical use of braces is for idiopathic curves that are not grave enough to warrant surgery, but they may also be used to prevent the progression of more severe curves in young children, to buy the child time to grow before performing surgery, which would prevent further growth in the part of the spine affected. Indications for bracing: people who are still growing who present with Cobb angles less than 20° should be closely monitored. People who are still growing who present with Cobb angles of 20 to 29° should be braced according to the risk of progression by considering age, Cobb angle increase over a six-month period, Risser sign, and clinical presentation. People who are still growing who present with Cobb angles greater than 30° should be braced. However, these are guidelines and not every person will fit into this table. For example, a person who is still growing with a 17° Cobb angle and significant thoracic rotation or flatback could be considered for nighttime bracing. On the opposite end of the growth spectrum, a 29° Cobb angle and a Risser sign three or four might not need to be braced because the potential for progression is reduced. The Scoliosis Research Society's recommendations for bracing include curves progressing to larger than 25°, curves presenting between 30 and 45°, Risser sign 0, 1, or 2 (an X-ray measurement of a pelvic growth area), and less than six months from the onset of menses in girls. Evidence supports that bracing prevents worsening of disease, but whether it changes quality of life, appearance, or back pain is unclear. Surgery is usually recommended by orthopedists for curves with a high likelihood of progression (i.e., greater than 45 to 50° of magnitude), curves that would be cosmetically unacceptable as an adult, curves in people with spina bifida and cerebral palsy that interfere with sitting and care, and curves that affect physiological functions such as breathing. Surgery is indicated by the Society on Scoliosis Orthopaedic and Rehabilitation Treatment (SOSORT) at 45 to 50° and by the Scoliosis Research Society (SRS) at a Cobb angle of 45°. SOSORT uses the 45 to 50° threshold as a result of the well-documented, plus or minus 5° measurement error that can occur while measuring Cobb angles. Surgeons who are specialized in spine surgery perform surgery for scoliosis. To completely straighten a scoliotic spine is usually impossible, but for the most part, significant corrections are achieved. A 50-year follow-up study published in the Journal of the American Medical Association (2003) asserted the lifelong physical health, including cardiopulmonary and neurological functions, and mental health of people with idiopathic scoliosis are comparable to those of the general population. Scoliosis that interferes with normal systemic functions is "exceptional" and "rare", and "untreated [scoliosis] people had similar death rates and were just as functional and likely to lead productive lives 50 years after diagnosis as people with normal spines". In an earlier University of Iowa follow-up study, 91 percent of people with idiopathic scoliosis displayed normal pulmonary function, and their life expectancy was 2% longer than that of the general population. Generally, the prognosis of scoliosis depends on the likelihood of progression. The general rules of progression are larger curves carry a higher risk of progression than smaller curves, and thoracic and double primary curves carry a higher risk of progression than single lumbar or thoracolumbar curves. In addition, people not having yet reached skeletal maturity have a higher likelihood of progression (i.e., if the person has not yet completed the adolescent growth spurt). In the health care system of the United States, the average hospital cost for cases involving surgical procedures was $30,000 to $60,000 per person in 2010. As of 2006, the cost of bracing has been published as up to $5,000 during rapid growth periods, when braces must be consistently replaced across multiple follow-ups. Since scoliosis was discovered by Hippocrates, physicians and orthopedic surgeons have sought to find a cure for the condition. In the mid-20th century, modern medicine and treatment made decreasing the progression of scoliosis within people and alleviating the pain they experienced possible. This was the result of the progression of scoliosis screenings and treatment. New ways were developed to treat scoliosis because the condition was increasingly understood among medical professionals and orthopedic surgeons. These treatments such as bracing and rod insertion into the spine were made possible at the turn of the 20th century. During this time, many schools subjected their students to physical examinations and posture tests. Students were believed to suffer from negative effects such as poor posture due to hunching over desks for hours in the classroom. Although these screenings were not intended to detect spinal curvature, physicians diagnosed many students with scoliosis. Scoliosis was considered a disease-based condition during the mid-20th century caused by tuberculosis or poliomyelitis. These diseases responsible for causing spinal deformities were successfully managed throughout the 1960s due to the distribution of vaccines and antibiotics. Despite the successful management of diseases causing spinal deformity, many people suffered from scoliosis with no known cause. The unknown cause was eventually determined to be idiopathic scoliosis. Alfred Shands Jr., an orthopedic surgeon, discovered that two percent of diagnosed people had non-disease related scoliosis. Idiopathic scoliosis, also known as the "cancer of orthopedic surgery", was determined to be dangerous because there was no current treatment. The condition needed to be detected in people promptly so treatment could be developed in time to halt its progression. As a result, schools made it mandatory for students to have screenings for scoliosis. Early on, set symptoms could be recognized among the students being tested from ages five to eighteen, but subsequent studies never confirmed them for this age-range. To begin the screenings, children would have their shoulder height, leg length and spinal curvature measurements taken while partially clothed. This was followed with the forward-bend test and bodily comparisons to wall charts that were printed reproductions of the ideal human posture. Unfortunately, these screenings were not always accurate and many students were misdiagnosed because poor posture could often be mistaken for scoliosis. One of the first treatments designed was the Milwaukee brace, a rigid contraption of metal rods attached to a plastic or leather girdle, designed to straighten the spine. As a result of the constant pressure the brace inflicted on a person's' spine, it was particularly painful and inconvenient to wear due to physical limits it imposed. Wearing the brace was known to cause jaw pain, skin irritation, muscle pain and low self-esteem among people. The 'Harrington rod' technique was the second major treatment for scoliosis to emerge and became the first significant surgical procedure to manipulate spinal positioning. This treatment was initially developed to treat paralytic scoliosis that resulted from the polio epidemic of the 1950s. The Milwaukee brace was the only nonoperative and noninvasive alternative to surgery at the time to provide postoperative correction to people with polio. A curve exceeding sixty degrees required the Harrington rod technique, otherwise the Milwaukee brace was recommended. However, Canadian physician, Elizabeth Wyne, observed that fifty percent of diagnosed people wearing the Milwaukee brace still required surgery later in life. Surgery may straighten the spine however it does not necessarily eradicate a person of all the pain they suffer from due to scoliosis. Individuals who undergo surgery are left with scars and often have a lack of feeling in their backs to the invasive nature of this treatment. Despite the advancements of scoliosis treatments, yet to be determined is a cure that is reliable, risk-free and that results in few or no consequences for people. There are links between human spinal morphology, bipedality, and scoliosis which suggest an evolutionary basis for the condition. Scoliosis has not been found in chimpanzees or gorillas. Thus, it has been hypothesized that scoliosis may actually be related to humans’ morphological differences from these apes. Other apes have a shorter and less mobile lower spine than humans. Some of the lumbar vertebrae in Pan are "captured", meaning that they are held fast between the ilium bones of the pelvis. Compared to humans, Old World monkeys have far larger erector spinae muscles, which are the muscles which hold the spine steady. These factors make the lumbar spine of most primates less flexible and far less likely to deviate than those of humans. While this may explicitly relate only to lumbar scolioses, it is possible that small imbalances in the lumbar spine could precipitate thoracic problems as well. ^ "scoliosis". Merriam Webster. Archived from the original on 11 August 2016. Retrieved 12 August 2016. ^ a b c d e f g h i j k l m n o p q r s t "Questions and Answers about Scoliosis in Children and Adolescents". NIAMS. December 2015. Archived from the original on 25 August 2016. Retrieved 12 August 2016. ^ a b c d e f "adolescent idiopathic scoliosis". Genetics Home Reference. September 2013. Archived from the original on 16 August 2016. Retrieved 12 August 2016. ^ a b Shakil, H; Iqbal, ZA; Al-Ghadir, AH (2014). "Scoliosis: review of types of curves, etiological theories and conservative treatment". Journal of Back and Musculoskeletal Rehabilitation. 27 (2): 111–5. doi:10.3233/bmr-130438. PMID 24284269. ^ Yang, S; Andras, LM; Redding, GJ; Skaggs, DL (January 2016). "Early-Onset Scoliosis: A Review of History, Current Treatment, and Future Directions". Pediatrics. 137 (1): e20150709. doi:10.1542/peds.2015-0709. PMID 26644484. ^ Agabegi, SS; Kazemi, N; Sturm, PF; Mehlman, CT (December 2015). "Natural History of Adolescent Idiopathic Scoliosis in Skeletally Mature Patients: A Critical Review". The Journal of the American Academy of Orthopaedic Surgeons. 23 (12): 714–23. doi:10.5435/jaaos-d-14-00037. PMID 26510624. ^ "scoliosis". Dictionary.com. Archived from the original on 16 August 2016. Retrieved 12 August 2016. ^ Zeichner, Steven L.; Read, Jennifer S. (4 May 2006). Handbook of Pediatric HIV Care. Cambridge University Press. p. 236. ISBN 9781139453042 – via Google Books. ^ Giachelli CM (March 1999). "Ectopic calcification: gathering hard facts about soft tissue mineralization". Am. J. Pathol. 154 (3): 671–5. doi:10.1016/S0002-9440(10)65313-8. PMC 1866412. PMID 10079244. ^ Thometz, J. G.; Simon, S. R. (1 October 1988). "Progression of scoliosis after skeletal maturity in institutionalized adults who have cerebral palsy". The Journal of Bone and Joint Surgery. American Volume. 70 (9): 1290–1296. doi:10.2106/00004623-198870090-00002. ISSN 0021-9355. PMID 3182881. ^ Koumbourlis, Anastassios C. (2006). "Scoliosis and the respiratory system". Paediatric Respiratory Reviews. 7 (2): 152–160. doi:10.1016/j.prrv.2006.04.009. PMID 16765303. ^ a b Weinstein, S. L.; Dolan, L. A.; Spratt, K.F. ; Peterson, K. K.; Spoonamore, M. J.; Ponseti, I. V. (2003). "Health and Function of Patients With Untreated Idiopathic Scoliosis: A 50-Year Natural History Study". JAMA. 289 (5): 559–567. doi:10.1001/jama.289.5.559. PMID 12578488. ^ a b Weinstein SL, Zavala DC, Ponseti IV (June 1981). "Idiopathic scoliosis: long-term follow-up and prognosis in untreated patients". The Journal of Bone and Joint Surgery. 63 (5): 702–12. doi:10.2106/00004623-198163050-00003. PMID 6453874. ^ Page 90 in: Elizabeth D Agabegi; Agabegi, Steven S. (2008). Step-Up to Medicine (Step-Up Series). Hagerstwon, MD: Lippincott Williams & Wilkins. ISBN 978-0-7817-7153-5. ^ a b c d Gorman, Kristen Fay; Julien, Cédric; Moreau, Alain (14 June 2012). "The genetic epidemiology of idiopathic scoliosis". European Spine Journal. 21 (10): 1905–1919. doi:10.1007/s00586-012-2389-6. PMC 3463687. PMID 22695700. ^ a b Ogilvie JW, Braun J, Argyle V, Nelson L, Meade M, Ward K (2006). "The search for idiopathic scoliosis genes". Spine. 31 (6): 679–681. doi:10.1097/01.brs.0000202527.25356.90. PMID 16540873. ^ Lucio Montanaro; Patrizio Parisini; Tiziana Greggi; Mario Di Silvestre; Davide Campoccia; Simona Rizzi; Carla R. Arciola (2006). "Evidence of a linkage between matrilin-1 gene (MATN1) and idiopathic scoliosis". Scoliosis. 1: 21. doi:10.1186/1748-7161-1-21. PMC 1769398. PMID 17176459. ^ a b Ogilvie J (2010). "Adolescent idiopathic scoliosis and genetic testing". Current Opinion in Pediatrics. 22 (1): 67–70. doi:10.1097/MOP.0b013e32833419ac. PMID 19949338. ^ Kouwenhoven JW, Castelein RM; Castelein (2008). "The pathogenesis of adolescent idiopathic scoliosis: review of the literature". Spine. 33 (26): 2898–2908. doi:10.1097/BRS.0b013e3181891751. PMID 19092622. ^ a b c Trobisch P, Suess O, Schwab F (December 2010). "Idiopathic Scoliosis". Disch Arztebi Int. 107 (49): 875–884. doi:10.3238/arztebl.2010.0875. PMC 3011182. PMID 21191550. 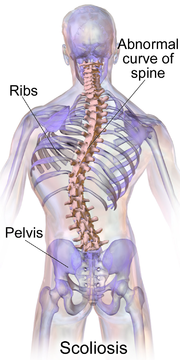 ^ "What is Scoliosis: What Causes Scoliosis?". MedicalBug. 17 February 2012. Archived from the original on 9 April 2012. Retrieved 18 March 2012. ^ Trontelj, J., Pecak, F., & Dimitrijevic, M. (1979). Segmental Neurophysiological Mechanisms in Scoliosis. The Journal of Bone and Joint Surgery Vol. 61-B, No. 3. HighWire. ^ "Fragile X syndrome". Department for Work and Pensions, U.K. Archived from the original on 19 March 2012. Retrieved 29 August 2011. ^ Davids, J. R.; Hagerman, R. J.; Eilert, R. E. (July 1990). "Orthopaedic aspects of fragile-X syndrome". J Bone Joint Surg Am. 72 (6): 889–96. doi:10.2106/00004623-199072060-00015. PMID 2195034. ^ "Scoliosis symptoms — pain, flat back, screening, self-assessment". iscoliosis.com. ^ "Scoliometer (Inclinometer)". National Scoliosis Foundation. Archived from the original on 21 November 2014. ^ Kim, Hana (November 2010). "Scoliosis Imaging: What Radiologists Should Know". RSNA RadioGraphics. 30 (7): 1823–1842. doi:10.1148/rg.307105061. PMID 21057122. The main purpose of performing CT or MR imaging in a patient with scoliosis is to identify an underlying cause. MR imaging is used with increasing frequency to evaluate patients with an unusual curve pattern or alarming clinical manifestations. Nevertheless, two reasons for performing such screening are plausible: First, the treatment of an underlying neurologic lesion could help alleviate progressive neurologic deterioration and lead to improvement or stabilization of scoliosis; second, surgery performed to correct scoliosis in the presence of an underlying neurologic disorder that has not been identified and treated could result in new or additional neurologic deficits. ^ "Early Onset Scoliosis | Scoliosis Research Society". www.srs.org. Archived from the original on 21 June 2016. Retrieved 10 July 2016. ^ Grossman, David C.; Curry, Susan J.; Owens, Douglas K.; Barry, Michael J.; Davidson, Karina W.; Doubeni, Chyke A.; Epling, John W.; Kemper, Alex R.; Krist, Alex H.; Kurth, Ann E.; Landefeld, C. Seth; Mangione, Carol M.; Phipps, Maureen G.; Silverstein, Michael; Simon, Melissa A.; Tseng, Chien-Wen (9 January 2018). "Screening for Adolescent Idiopathic Scoliosis". JAMA. 319 (2): 165. doi:10.1001/jama.2017.19342. PMID 29318284. ^ Page 89 in: Dr. Kevin Lau. The Complete Scoliosis Surgery Handbook for Patients: An In-Depth and Unbiased Look Into What to Expect Before and During Scoliosis Surgery. Health In Your Hands. ISBN 9789810785925. ^ "Treating scoliosis in children". NHS Choices. 19 February 2013. Archived from the original on 14 May 2014. Retrieved 14 May 2014. ^ "Scoliosis – Treatment in adults". NHS Choices. 19 February 2013. Archived from the original on 14 May 2014. Retrieved 14 May 2014. ^ "Idiopathic Scoliosis – Adult Nonoperative Management". Scoliosis Research Society. Archived from the original on 1 July 2014. Retrieved 14 May 2014. ^ "Idiopathic Scoliosis – Adult Surgical Treatment". Scoliosis Research Society. Archived from the original on 1 July 2014. Retrieved 14 May 2014. ^ Negrini S, Fusco C, Minozzi S, Atanasio S, Zaina F, Romano M (2008). "Exercises reduce the progression rate of adolescent idiopathic scoliosis: results of a comprehensive systematic review of the literature". Disability and Rehabilitation. 30 (10): 772–785. doi:10.1080/09638280801889568. PMID 18432435. ^ Negrini, S; Donzelli, S; Aulisa, AG; Czaprowski, D; Schreiber, S; de Mauroy, JC; Diers, H; Grivas, TB; Knott, P; Kotwicki, T; Lebel, A; Marti, C; Maruyama, T; O'Brien, J; Price, N; Parent, E; Rigo, M; Romano, M; Stikeleather, L; Wynne, J; Zaina, F (2018). "2016 SOSORT guidelines: orthopaedic and rehabilitation treatment of idiopathic scoliosis during growth". Scoliosis and Spinal Disorders. 13: 3. doi:10.1186/s13013-017-0145-8. PMC 5795289. PMID 29435499. ^ Wood, G.I. (2013), Society on Scoliosis Orthopaedic and Rehabilitation Treatment (SOSORT): The Cheneau Brace using Rigo Principles and the Wood Cheneau Rigo (WCR) Brace. Chicago, IL. ^ Negrini, S; Minozzi, S; Bettany-Saltikov, J; Chockalingam, N; Grivas, TB; Kotwicki, T; Maruyama, T; Romano, M; Zaina, F (18 June 2015). "Braces for idiopathic scoliosis in adolescents". The Cochrane Database of Systematic Reviews (6): CD006850. doi:10.1002/14651858.CD006850.pub3. PMID 26086959. ^ Negrini S, et al. Scoliosis Orthopaedic and Rehabilitation Treatment, SOSORT guidelines: Orthopaedic and Rehabilitation treatment of idiopathic scoliosis during growth. 2011. Negrini, Stefano; Aulisa, Angelo G.; Aulisa, Lorenzo; Circo, Alin B.; De Mauroy, Jean Claude; Durmala, Jacek; Grivas, Theodoros B.; Knott, Patrick; Kotwicki, Tomasz; Maruyama, Toru; Minozzi, Silvia; O'Brien, Joseph P.; Papadopoulos, Dimitris; Rigo, Manuel; Rivard, Charles H.; Romano, Michele; Wynne, James H.; Villagrasa, Monica; Weiss, Hans-Rudolf; Zaina, Fabio (2012). "2011 SOSORT guidelines: Orthopaedic and Rehabilitation treatment of idiopathic scoliosis during growth". Scoliosis. 7 (1): 3. doi:10.1186/1748-7161-7-3. PMC 3292965. PMID 22264320. . Accessed January 27, 2013. ^ Yu, Wenwei; Chattopadhyay, Subhagata; Lim, Teik-Cheng; Acharya, U. Rajendra (3 December 2012). Advances in Therapeutic Engineering. CRC Press. ISBN 9781439871744. ^ "Adolescent Idiopathic Scoliosis | Scoliosis Research Society". www.srs.org. Retrieved 28 February 2018. ^ a b c d Negrini, S., Aulisa, A.G., Aulisa, L., Circo, A.B., Claude de Mauroy, J., Durmala, J., Grivas, T.B., Knott, P., Kotwicki, T., Maruyama, T., Minozzi, S., O’Brien, J.P., Papadopoulos, D., Rigo, M., Rivard, C.H., Romano, M., Wynne, J.H., Villagrasa, M., Weiss, H., Zaina, F. (2012). 2011 SOSORT guidelines: Orthopaedic and Rehabilitation treatment of idiopathic scoliosis during growth. 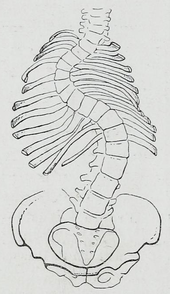 Scoliosis, 7 (3), 1–35. ^ Edery P.; Margaritte-Jeannin P.; Biot B.; Labalme A.; Bernard J.; Chastang J.; Kassai B.; Plais M.; Moldovan Fl. ; Clerget-Darpoux F. (2011). "New disease gene location and high genetic heterogeneity in idiopathic scoliosis". European Journal of Human Genetics. 19 (8): 865–869. doi:10.1038/ejhg.2011.31. PMC 3172921. PMID 21407261. ^ Burwell, R.G. (2003). Aetiology of idiopathic scoliosis: current concepts. Pedriatric Rehabilitation, 6 (3–4), 137–170. ^ Larson N (2011). "Early onset scoliosis: What the primary care provider needs to know and implications for practice". Journal of the American Academy of Nurse Practitioners. 23 (8): 392–403. doi:10.1111/j.1745-7599.2011.00634.x. PMID 21790832. ^ Kamerlink, J., Quirno, M., Auerbach, J., Milby, A., Windsor, L., Dean, L., Dryer, J., Errico, T., Lonner, B. (2010). Hospital cost analysis of adolescent idiopathic scoliosis correction surgery in 125 consecutive cases. Journal of Bone and Joint Surgery, 92-A (5), 1097–1104. ^ Linker, Beth (2012). "A dangerous curve: the role of history in America's scoliosis screening programs". American Journal of Public Health. 102 (4): 606–616. doi:10.2105/AJPH.2011.300531. ISSN 1541-0048. PMC 3489358. PMID 22397340. ^ a b c d e f g Lovejoy OC (2005). "The natural history of human gait and posture: Part 1. Spine and pelvis". Gait & Posture. 21 (1): 95–112. doi:10.1016/s0966-6362(04)00014-1. ^ Harcourt-Smith, William E (2007). Handbook of Paleoanthropology. Chapter 5: Springer Berlin Heidelberg. pp. 1483–1518. ^ Hunt, Kevin D (March 1994). "The evolution of human bipedality: ecology and functional morphology". Journal of Human Evolution. 26 (3): 182–202. doi:10.1006/jhev.1994.1011. ^ M. Stenning; I. Nelson (2011). "Recent advances in the treatment of scoliosis in children". British Editorial Society of Bone and Joint Surgery. Archived from the original on 2 January 2014. Retrieved 1 January 2014. Wikimedia Commons has media related to Scoliosis. Early Onset Scoliosis is the abnormal, side-to-side curve of spine in children under 5 years old, often including children with congenital scoliosis (present at birth, with spine abnormalities) and infantile scoliosis (birth to 3 years).